So you're making a curry. For eight people (lucky you). But there are two kids and two adults that don't like their food spicy, while the others do. What do you do? Just make a mild curry for everyone? Or make two curries - a Korma and a Madras and try and please everyone? As a chilli lover, it's a situation I'm in all the time with my family, who won't touch spicy food. And one company, Uncle Wilbur's, thinks they've cracked it. What they've done is blend ground spices together to create a pretty much instant curry sauce. And then they've added in these 'hotshots' (heat capsules), which you add depending on your tolerance (and need) for chillies. The idea is that you cook the curry and then dish up the children's meals, keeping them warm. Chuck a heat capsule or two into your still simmering curry and then you've got a hotter version for the chilli lovers. There's also a spice guide included, which will guide you on how many chilli capsules to add into your curry. 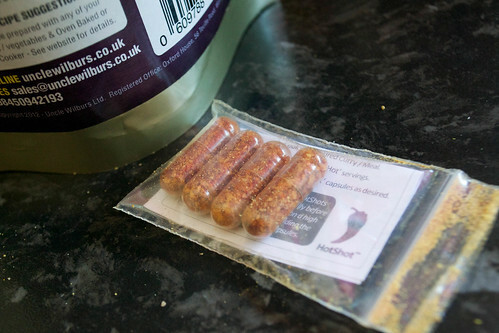 The capsules dissolve into the sauce and you're just left with ground chillies in there, but if you want to you can open the capsules out and just tip in the chillies (although Uncle Wilbur's assures us on the pack that the hotshots are suitable for vegetarians). 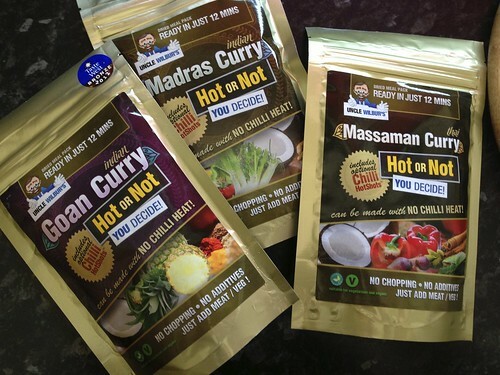 They sent me a few of their 'Hot or Not' curry blends to try. To be honest, my experience with ground spice curry blends up until now hasn't been brilliant. I've generally found them to be quite grainy, a bit watery and the flavours too intense - not rich and mellow as it is when you've been simmering a freshly-made curry for a while. But once I made these I was actually pleasantly surprised. They weren't grainy and watery but thick and dark. 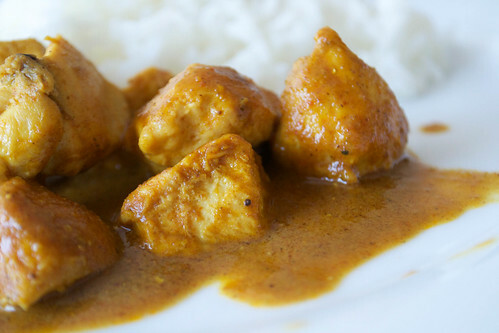 The Goan curry (which was awarded a Bronze 'Taste of the West' Award in 2012) had a slightly sour flavour to it, which was fresh-tasting and quite addictive. And if you serve the curry as it is, without capsules, there is absolutely no chilli heat in there at all. Just fragrant spices. The children loved it. 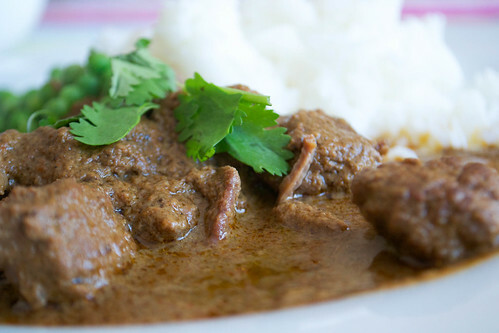 Having had success on the stove, the Massaman curry was put through its paces in the slow cooker, with some diced beef. I just browned the meat in the pan and tipped it into the slow cooker. I prepared the sauce by stirring the spices into the meat juices still in the pan and then adding water to make a silky sauce. This was poured over the beef in the crockpot, and stirred together. After a few hours of gentle simmering it was, again, a success and my husband, who is usually very fussy when it comes to curries, really enjoyed it. There are a few different curry blends made by Uncle Wilbur - which include Thai Green curry, Jalfrezi and Rogan Josh. I'd like to give the Thai Green curry a try, just to see if it's as creamy as I would expect. Are these curries exactly the same as a home-made curry using fresh spices, herbs and veggies? I don't think they are. But they're a great solution for families and cater for different spice tolerances and my girls really did love them. And it was the first time they'd eaten a Massaman or Goan curry without fear of it being spicy, but still got to taste the differences between the flavours. Have you tried any of Uncle Wilbur's 'Hot or Not' curries? What did you think? I'm probably being unfair, and I don't have kids so I'm clearly not the target audience, but it seems like a gimmick to me. No reason not to do exactly the same with any curry you make, whether from scratch or any mild ready-made sauce -- once cooked, divide into two and add chilli to the portion for adults/ chilli heads. Can tarka the chilli to make sure it's cooked out, if that's the worry. That said, if they are nice and the price is right, why not? I agree Kavey, but some sauces that are labelled 'mild' are still too spicy for some people, especially young children or people with sensitive stomachs - we found that last week with a jar of Co-Op sauce - it's much easier (and safer) to make your curries from scratch and then you can control the heat that goes into them and add the chilli once you've dished the other meals up. But a lot of people don't cook from scratch and with one of these packs taking just over 10 minutes to cook then I can see how it could be a good thing for some people to keep in the cupboard. But to be honest, there's nothing like a home-made curry you've cooked yourself, this is true.